It’s one hell of a list to narrow down, but that hasn’t stopped us from giving it our best shot. Have your favourite boots made our top three? 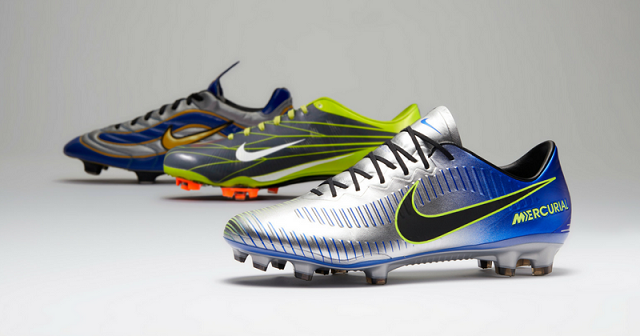 Since the dawn of the football boot, it seems as though we’ve seen every imaginable design and colourway. The days of all-black leather have been and gone, as the biggest brands in the world continue to unveil flamboyant new designs and implement the latest boot technology. 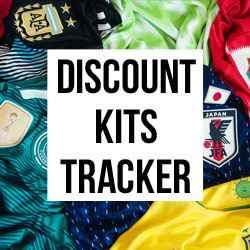 The result has been a constant stream of fantastic football boots, each one pushing the boundaries that little bit further and adding some fresh character to the ‘beautiful game’. But what are the greatest football boots of all time? 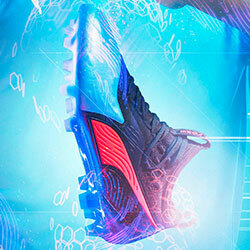 If you’ve made it into our top 3, then it’s fair to say you’ve made one hell of a football boot. Or, you know, your marketing department have just really brought their A game to raise some serious hype. 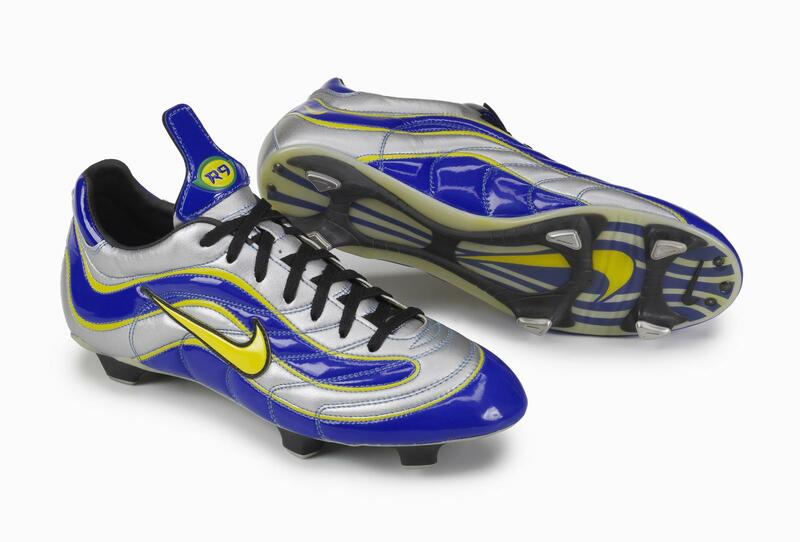 Shortly before the 2002 FIFA World Cup, Nike released a pair of boots that would become as iconic as the players that wore them. Those who saw it will still remember the classic TV advert for the boot release. Ronaldo Nazario, Edgar Davids, Francesco Totti, Thierry Henry, Luis Figo, Roberto Carlos- the list goes on - all playing 3-a-side in the hull of a shipping container named ‘The Cage’, and all refereed by the one and only Eric Cantona. Oh, and the soundtrack was awesome, too. They really don’t make adverts like that anymore- which is a shame, because it sent all the Vapor hype into overdrive. The Vapor evolved from the Nike Air Mercurial, which was developed specifically for Ronaldo for the 1998 World Cup. From R9 to CR7, the Mercurial has been worn by countless world class players down the years, as it’s continued to etch itself into footballing history. No boot makes such a stamp on the football pitch for over 15 years without having something special about it. I mean, just look at what Thierry Henry was able to do in his pair of Vapor II’s. Outrageous stuff. Since their release in 1979, these boots have changed little in design but are still one of the world’s best-selling boots 40 years later. Sometimes you just can’t beat the classics. 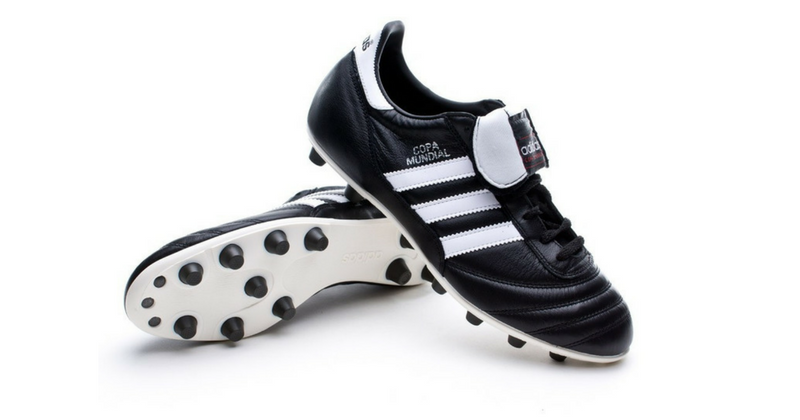 The adidas Copa Mundial were developed for use in the 1982 World Cup. 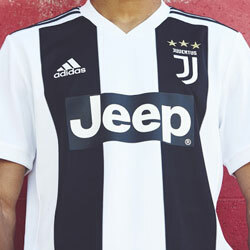 They were gimmick-free and never benefitted from high-profile advertising campaigns like their Predator cousins did; they were also reasonably basic in design and modestly priced. So, what was it about these boots that helped them find their way onto the feet of Diego Maradona, Franz Beckenbauer and Zinedine Zidane? 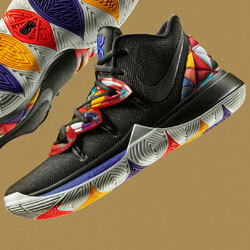 Rather than image, the design was centred around weight and comfort. They were made from kangaroo leather - or K-leather as we now call it - which made them the lightest boots on the market. It was the success that players such as Beckenbauer and Michel Platini enjoyed whilst wearing these boots which made everyone want a pair. 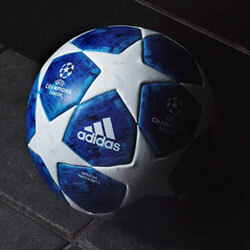 The designs are simple compared to the likes of the Nike Mercurial: but the Copa Mundial did its talking on the pitch. England won the World Cup in 1966, but who won the Golden Boot that year? It’s a common pub quiz question that everyone knows the answer to by now, but how many people know which boots Eusebio was wearing that summer? We gave it away slightly- but it’s the Puma King. 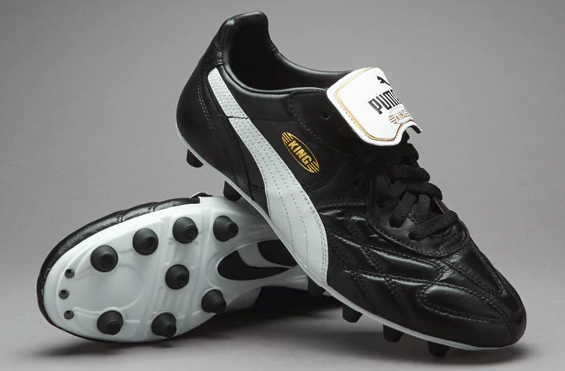 Before Nike and adidas dominated the footballing boot world, Puma really were king. There was a time when the Puma King was the absolute must-have choice for the best footballers. Pele, Maradona, Johan Cruyff and Lothar Matthaus all graced the pitch in Puma Kings- not a bad lineup at all, eh? In a piece of exquisite marketing from Puma during the 1970 World Cup, Pele famously bent down to tie his special-edition Kings, halting kick-off for a few moments and allowing the TV cameras to get a good shot of the boots before the quarter-final got started. Some say he was paid highly by Puma to perform the stunt; others say he just forgot to tie his laces. Either way, it made the world go nuts for the Puma King. Modern King designs lack the iconic tongue that looked as though your boots were in the thralls of an allergic reaction; but even today, 50 years after their first release, these football boots still sell in their millions. We’ve taken a look through the archives and handpicked some of our favourite red football boot colourways.